Description: Includes a GameShark tutorial on a VHS cassette. Box Text: Abuse The Power! 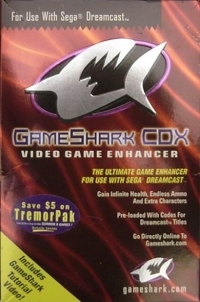 GameShark CDX is the ultimate game enhancer for use with Sega Dreamcast. With GameShark CDX, you can take your gaming to new levels of fun and excitement. Gain access to new levels and weapons with the press of a button. Even the odds with infinite health, endless ammo and unlimited time. Obtain those hard to find objects with ease. Nothing is impossible with GameShark CDX! 03-28-2016 silverbow Description Includes a GameShark tutorial on a VHS cassette. 03-28-2016 silverbow Box Text Abuse The Power! 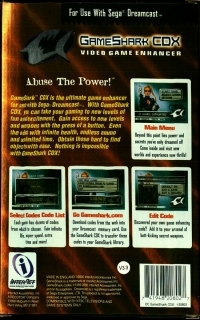 GameShark CDX is the ultimate game enhancer for use with Sega Dreamcast. With GameShark CDX, you can take your gaming to new levels of fun and excitement. Gain access to new levels and weapons with the press of a button. Even the odds with infinite health, endless ammo and unlimited time. Obtain those hard to find objects with ease. Nothing is impossible with GameShark CDX! This is a list of VGCollect users who have GameShark CDX Video Game Enhancer in their Collection. This is a list of VGCollect users who have GameShark CDX Video Game Enhancer in their Sell List. This is a list of VGCollect users who have GameShark CDX Video Game Enhancer in their Wish List.